Sulzbach-Rosenberg. (cog) Seventeen SRIMF vocal students are sitting in a circle in one of the practice rooms of the School of Song and Music. They are working through Schubert's "Heideröslein" and Schumann's "Dichterliebe." But today, it's not just about the beautiful sounds of well-practiced voices: here, they focus on the text. Lead by Sophie Ritz, the young singers plow through the unaccustomed sequences of letters. Ritz goes over each of the difficult passages with them patiently and, although they must visibly exert themselves, they are having a great time. 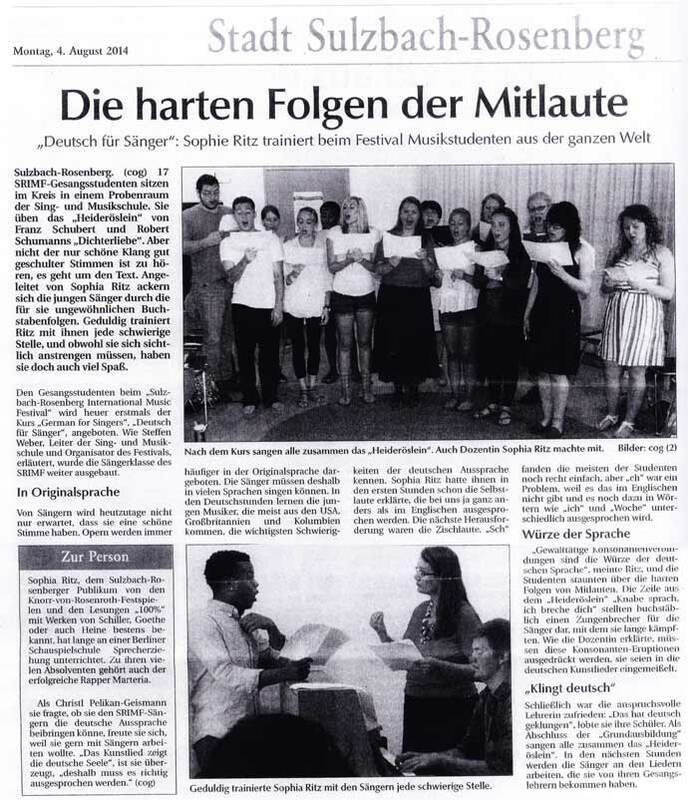 This year, for the fourth time, the students of the Sulzbach-Rosenberg International Music Festival are being offered a "German for Singers" course. As Steffen Weber, head of the School of Song an, explains, the SRIMF's curriculum for singers is being expanded. Singers today are not only expected to have beautiful voices; more and more, operas are performed in the original language and therefore singers must be able to sing in many languages. In their German classes, these young musicians (who mostly come from the United States, Great Britain and Columbia) confront the difficulties of German pronunciation. In their first lesson, Sophie Ritz explained the vowels to them, which are pronounced very differently in German than in English. The next challenge was the sibilants: most of the students had no trouble with 'sch,' but 'ch' was a big problem, because there is no equivalent in English and it is pronounced differently in words like 'ich' (I) and 'Woche' (week). "Violent collections of consonants give the German language its special flavor," says Ritz and her students marveled at the harsh sequences of consonants. The lines of the "Heideröslein" ('The Little Rose on the Heath," in English) were literally a tongue-twister for the singers, with which they struggled for quite some time. As their teacher explained, these eruptions of consonants must be expressed: they are an integral part of German art-song. Finally, their demanding teacher was satisfied: "that sounded like German," she praised her pupils. At the end of their first German class, they sang the "Heideröslein" once more. In coming classes, the students will work on German songs assigned by their vocal instructors.